My year as a HLF trainee ended in June 2013. Very sad times as I loved the team at Cheadle, Stockport’s varied collection and also the variety of the role. Soon after, I started some casual work for Wigan Leisure and Culture Trust – who were embarking on a collections store move. This entailed supervising any of the sites which were being emptied by the contractors and working with them to document the removal of objects. This was a great opportunity to see some of Wigan’s museum collections, where they had been stored and where they were going to. It was also brilliant to work with the removal specialists, and see large-scale packing close-up! I then set up as a sole-trader in July/August, for collections curatorial work. And so was born Emma Hadley Curatorial Services! (it still makes me cringe a bit having my own name in the title but there you are). Since then, I have been extremely lapse in writing blog posts, but I have been very active on my twitter account @emma_museums, so I don’t feel too bad about that. 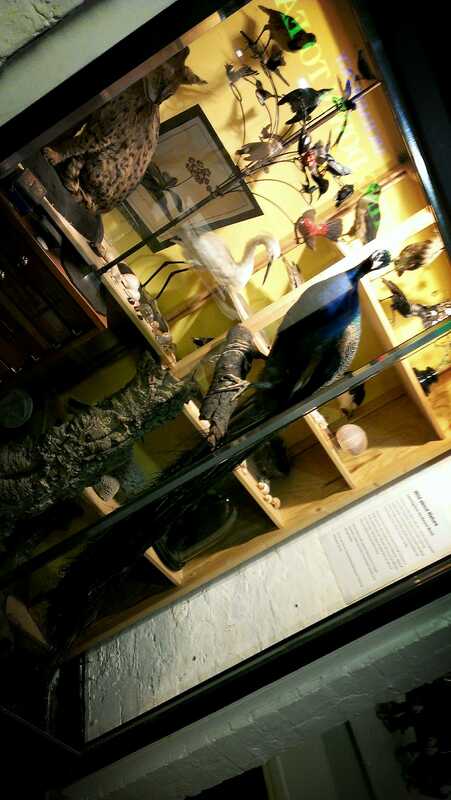 What gave me a kickstart into writing this post was #MuseumsWeek, and being nominated to do the ’11 questions to a museum blogger’ by Lauren Field, the HLF collections trainee 2013-2014 (see her blog HERE, and Katie Senior, who is the museums techincal HLF trainee for 2013-2014 was also nominated, see her blog HERE). Hence this being a very shoddy and rather rushed blog post before I dive into the ’11 questions’ post before #MuseumsWeek is over! Emergency Planning/Disaster Planning/Emergency Salvage, however you want to name it. This meant inventorying objects at various museums and sites, creating salvage cards for these priority objects, and also creating an advice pack for how to deal with various emergency situations in a museum setting; for example, the aftermath of a fire and what to do with fire damaged/water damaged objects (fingers crossed this never happens anywhere, ever!). During this time I found a great free app, based on the disaster planning ‘wheel’, called Emergency Salvage Response (ERS). You can get more information on the app HERE. Accessioning. My favourite! Dealing with donations/new acquisitions, recent acquisitions, and backlog… corresponding with donors, researching objects, creating object history files… adding records to the museum database, marking the object with the correct method, wrapping and storing, preventative conservation and conservation cleaning… The list is endless and it has been amazing to work through such a variety of objects. 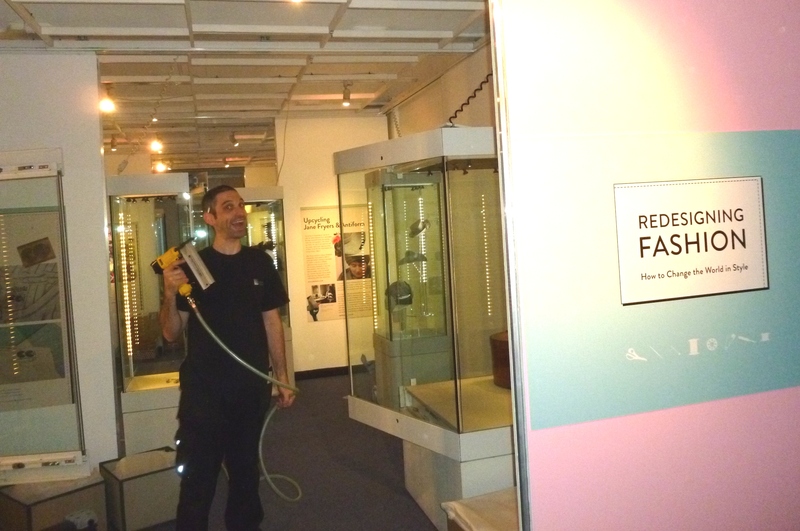 ALL museums have backlogs of objects waiting to be accessioned, and unfortunately because of cuts and strains on staff time, the backlog problem will only increase for many museums across the country. So there we have it, I apologise for how short and rushed and shoddy this post is, but if you haven’t already, please see my tweets for images of lovely and interesting objects I have accessioned during my freelance contract, and what I have been up to since June 2013… I hope to be good and write blog posts more often from now on. 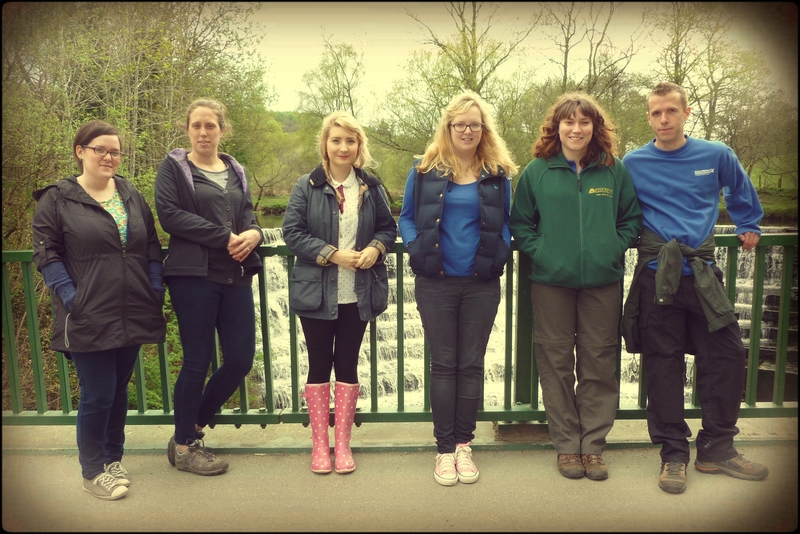 2012-2013 HLF Trainees at Etherow Country Park. L-R: Emma Harrold, Juliette Griffiths, Emma Hadley, Katie Paton, Emma Key, Greg Booth. Rosie Brady should be here although she now has a job with English Heritage, which is brilliant! Since January all of the trainees and I have wanted to meet up and experience half a day in each of the Skills for the Future jobs. First we met Emma and Katie at the Local Heritage Library to find out about researching family history and local archive records, and using the archive and library stack. Then everyone came to the heritage stores and I showed them Modes, searching for objects, retrieving and wrapping objects, object marking and image reference numbers. We then met Emma and Greg for a walk around Etherow Country Park to see the area maintained and patrolled by the Countryside rangers, and the issues which can arise (such as changing water levels, repairing walkways, animal rescue!) 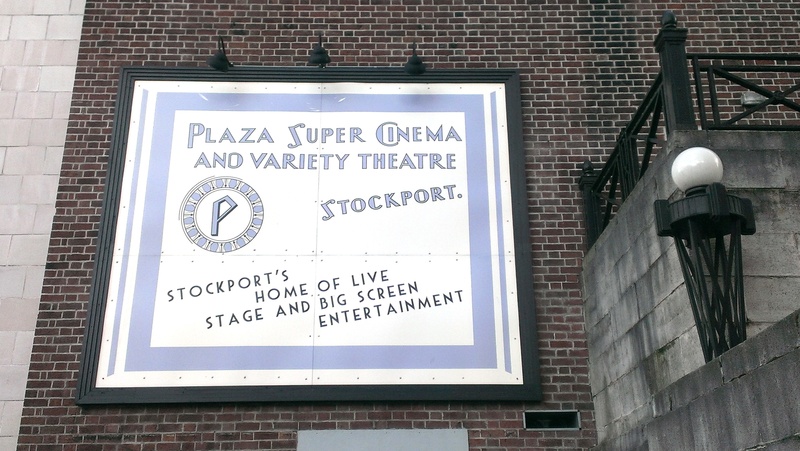 and yesterday our visits culminated in a walk around Stockport with Juliette to see conservation areas and parts of Stockport which have been improved due to the Townscape Heritage Initiative (THI). We learnt about planning permission, appraisals, and inappropriate tarmac on conservation area cobblestones (!). Some of the new intake of HLF trainees joined us on this trip, so it was nice to meet the newbies and for us all to offer them any pearls of wisdom for their upcoming year. Here are a few images from our visits – click the images to open a gallery slideshow. …I found it in the library stack! Showing the others a donation object and an Entry form. This is a money box made from a shell casing – Trench Art. It is a money box honest! Tarmac on cobblestones at Dodge Hill – not conservation area appropriate! oversees the Skills for the Future programme for the area. The success of the programme could possibly secure further funding opportinities, and can improve the programmes for the year 2013-2014. 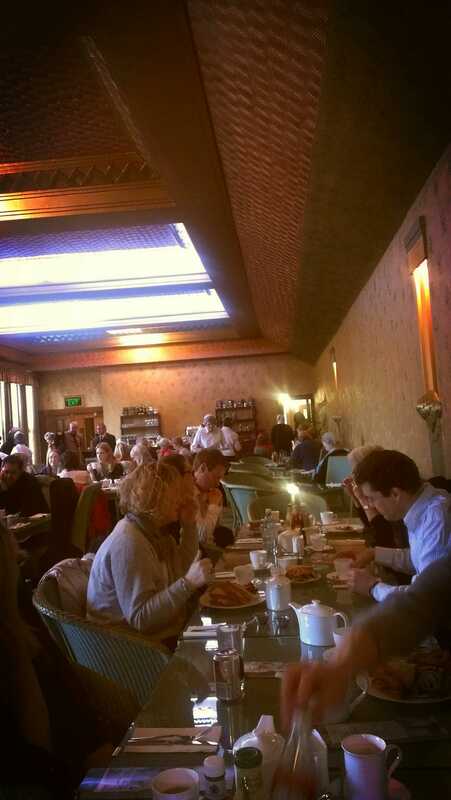 We ended the discussion with a trip to the Plaza tearoom and then it was back to the stores to carry on with Vernon Park decant documentation! It was lovely to meet Sally and hear about her role within the HLF, and that there are opportunities for networking or experiences within other organisations across the North West who are also part of the Skills for the Future programme. 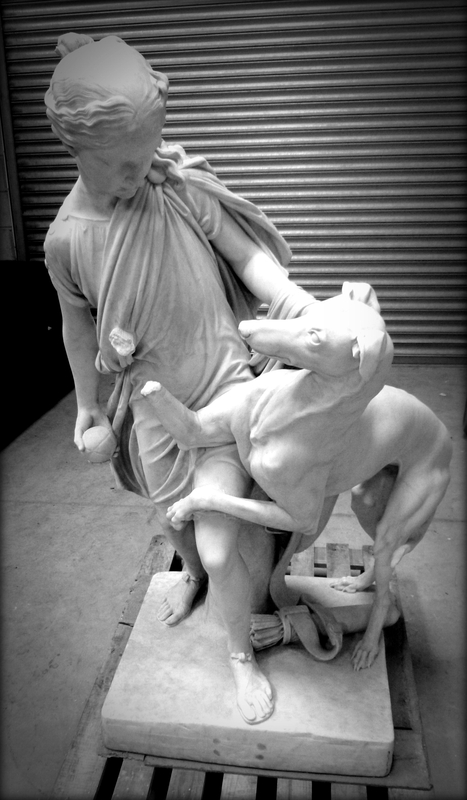 A Henry Weekes marble sculpture entitled ‘Play’, which is part of our collection and has previously been on display at Stockport Art Gallery and Woodbank Hall, was damaged in 2010. 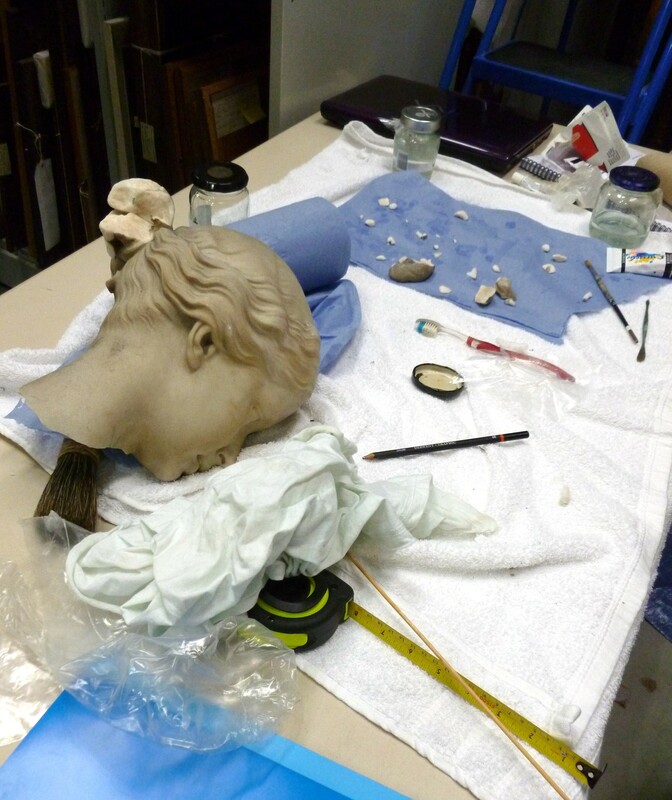 The damage to the sculpture resulted in the decapitation of the head, thus needing conservation work to restore it. Jane Foley of Foley Conservation was appointed to work on the sculpture. 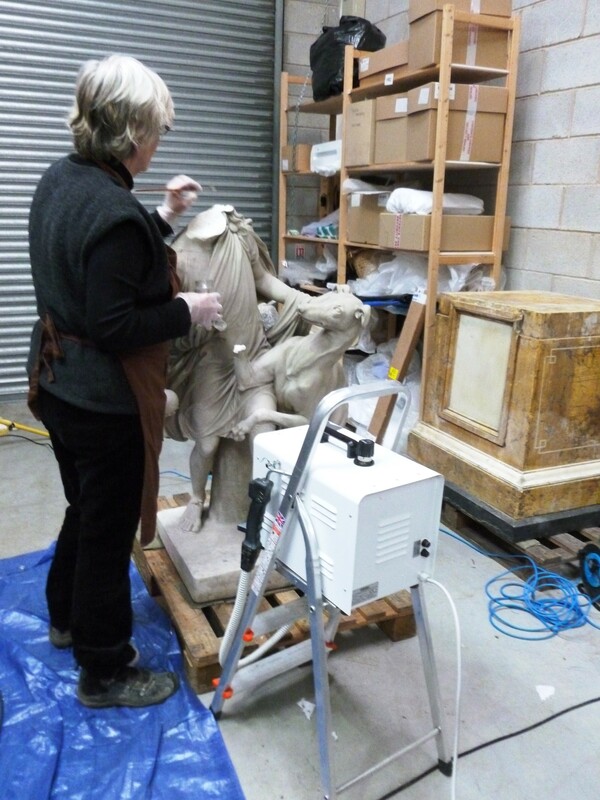 The sculpture was cleaned using a steamer with distilled water, and preparing the surface with various percentages of paraloid solution. 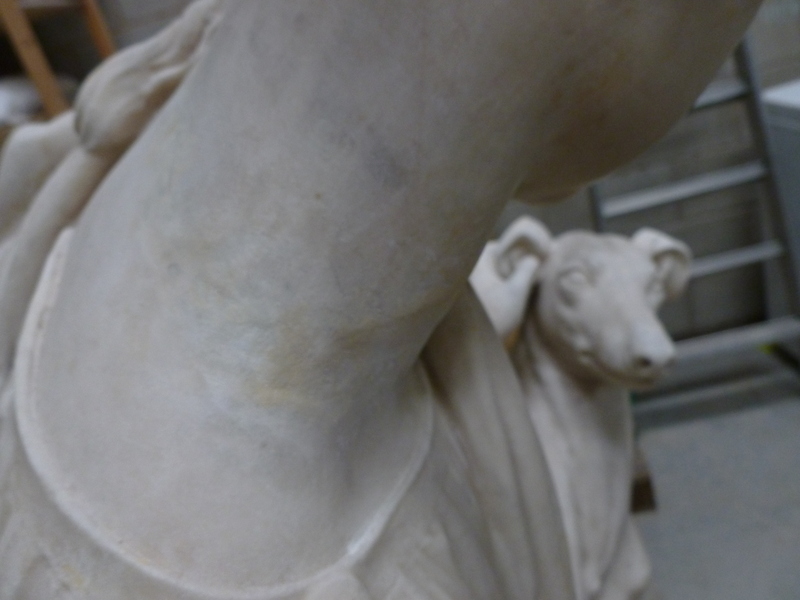 The angle of the head meant that a hoist was needed when fixing the head into position, and for leaving it to set without the danger of it coming away from the main body of the statue again. Here are some images from the process. 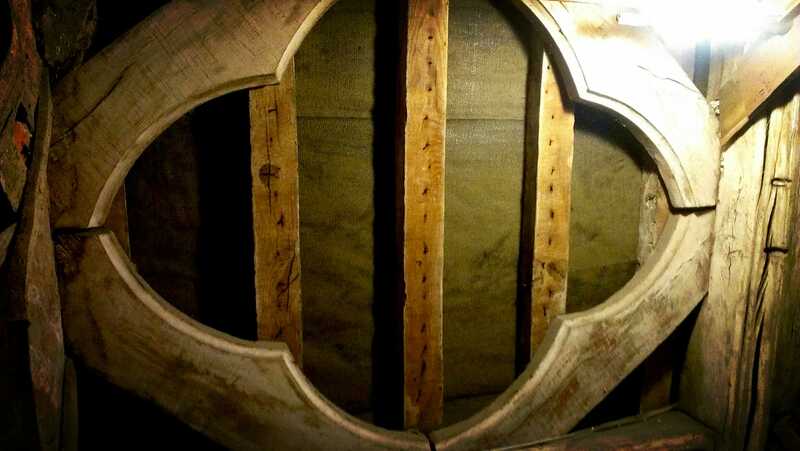 The final result is beautiful, and it was brilliant to be able to see the conservation process from beginning to end. complete with acquisition and donor details, detailed description, condition report and measurements. 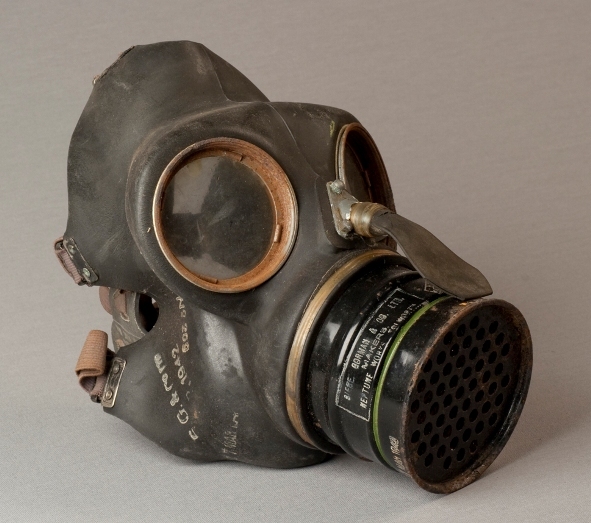 The objects were then marked with the appropriate tools, and the gas mask bag, as a textile, was frozen for precautionary purposes. The items which were photographed for use on the interpretation panels were then found a home to be put straight into the collection. 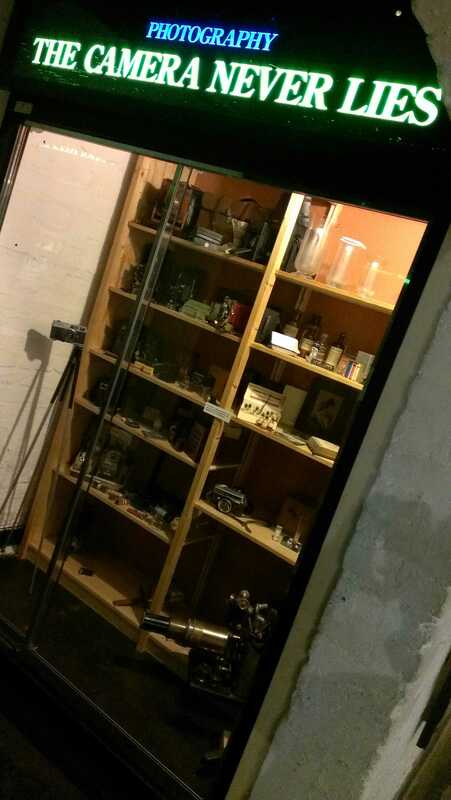 The items which are to be used in the display case (the feeding cup and the Anti-Dim solution) were put in a temporary location with the other objects awaiting display at the Shelters site. 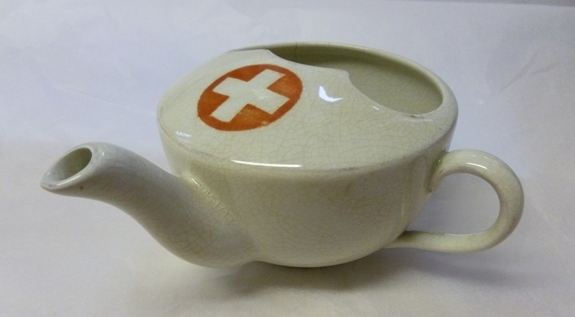 STOPM: 2013.27 – Red Cross feeding cup. 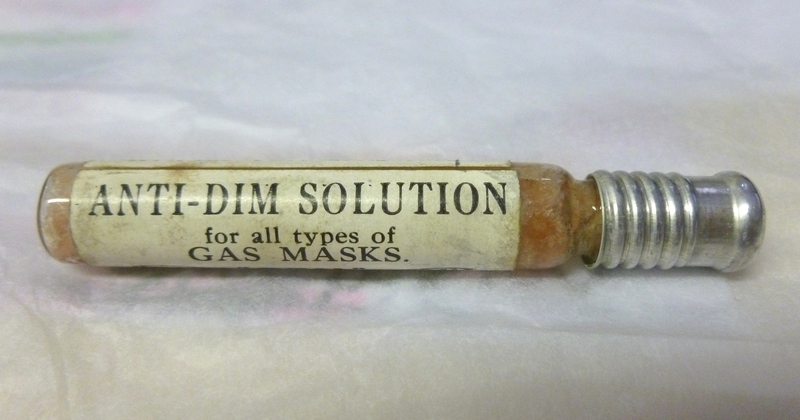 This was used by the donor’s Aunt; a nurse in both WWI and WWII. 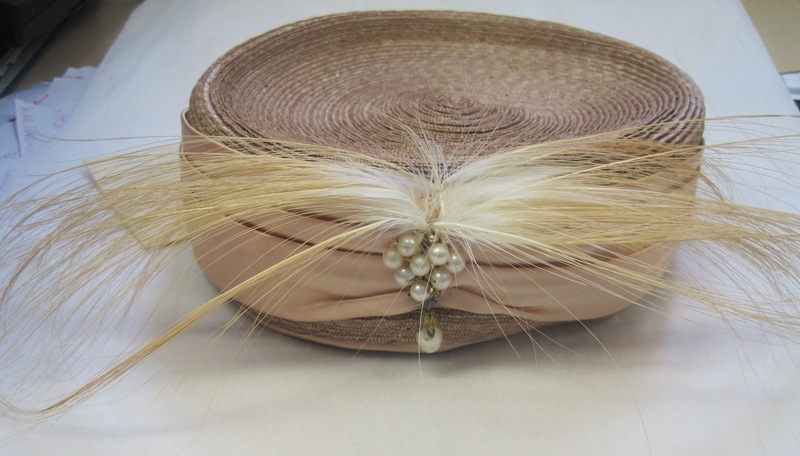 I am also currently accessioning a variety of American and British 1930s – 1970s hats which were kindly donated to us by a milliner and collector of hats. Researching hat labels found inside the hats is very interesting and has helped me to date the hats more specifically. Hats include a 1950s-60s swirled rosette hat made with pleated ribbon by Edward Mann of London; a 1950s ‘whimsy’ cocktail hat made by The United Hatters of North America; a hat box from the millinery section of the department store Sage-Allen & Co. of Connecticut, and a hat with a veil and feathers from the ‘Dover’ line of hats made by Henry Pollak of New York. 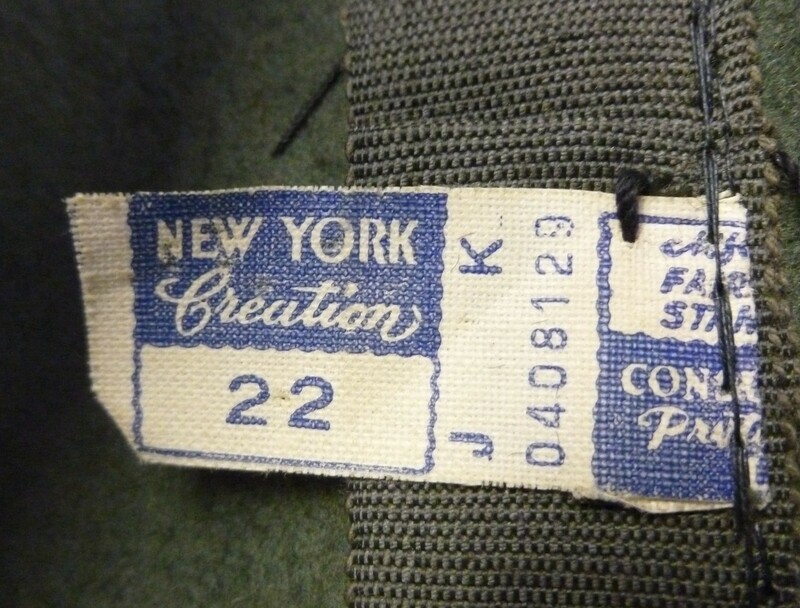 The Pollak hat also features a New York Creation label which shows the consumer the hat is made by a member of the New York Dress Institute which dates the hat to the late 1940s – 50s. 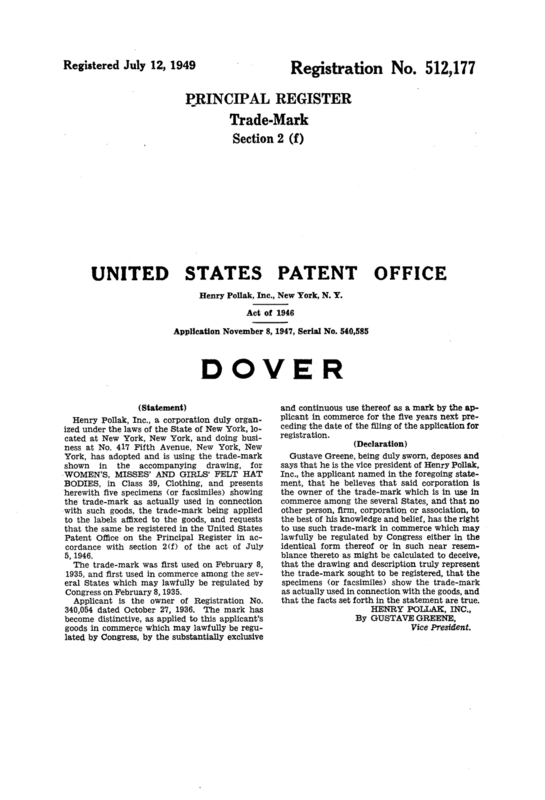 I was able to find some information about Pollak’s ‘Dover’ line, found here at Trade.mar.cx which is an online collection of worldwide trademarks. 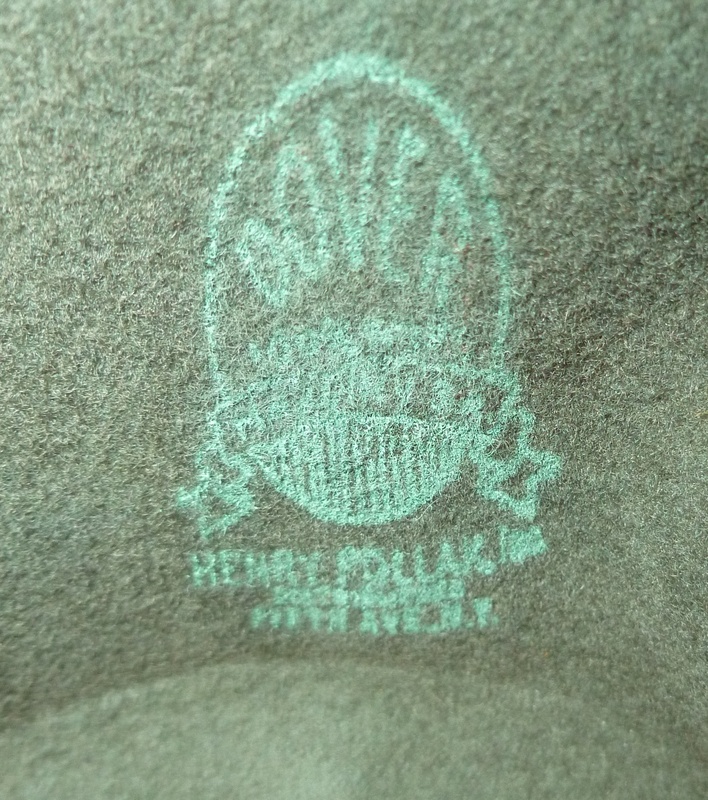 The application for the trademark of the ‘Dover’ line was made to the United States Patent office in 1947 by Henry Pollak Inc., and so dates the hat from 1947 onwards to 1955 when the New York Creation label was last used. 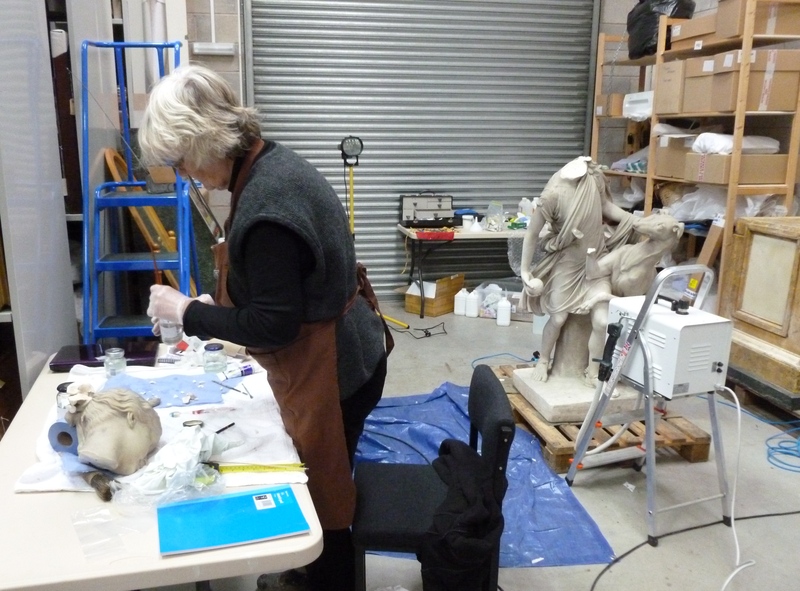 After Christmas, one of our priorities was to organise the decant of all objects from Vernon Park Museum before April. The objects were displayed in the basement of the museum, in various themed cases; ethnography, retail, male costume, female costume, education, archaeology, natural history, sound, photography, contemporary collecting, and WWII. 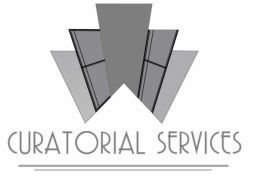 Vernon Park will now become wholly run by Pure Innovations Ltd., who currently run a cafe in the building. It is a shame about the museum being taken out of the equation as it is a significant building for Stockport’s museum history, and it held such an eclectic mix of objects which many people choose to visit and have voiced their sadness about. 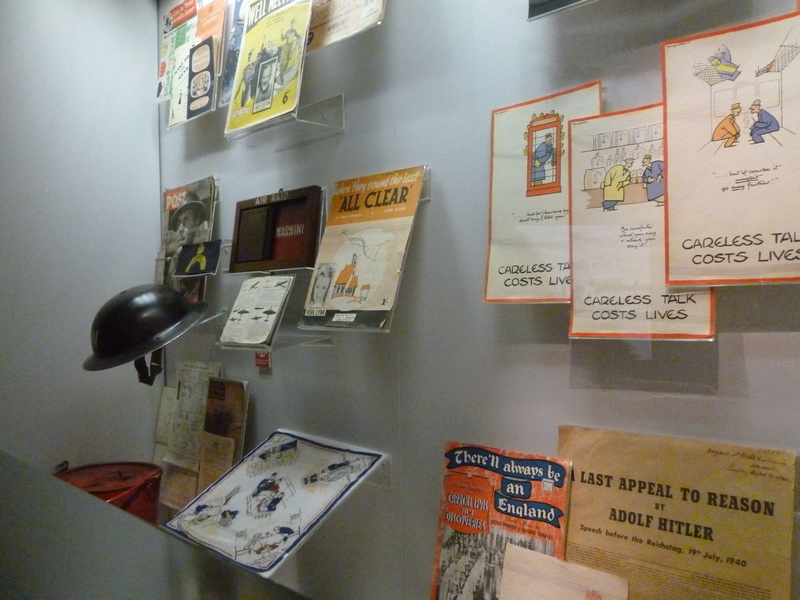 Hopefully many of the objects will be redisplayed elsewhere, including after the redevelopment of Stockport Story museum which is starting soon after the completion of the Air Raid Shelters project. Overall we removed over 2800 objects, and are still in the process of documenting the movements for each object and integrating them back into the collections storage. 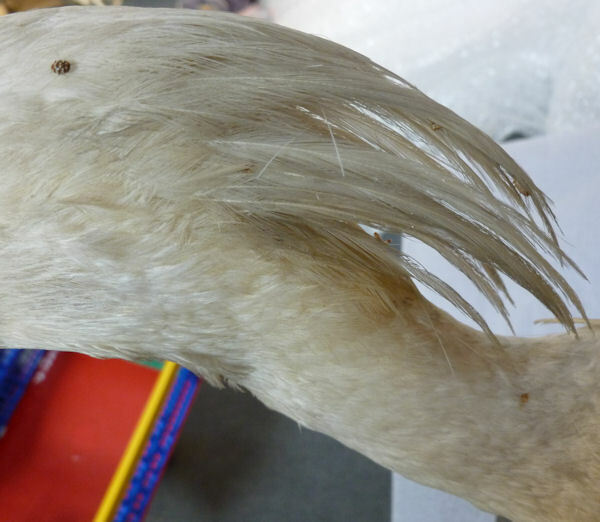 Some of the items have needed precautionary freezing before this can happen – especially the natural history taxidermy. Here are a few photographs from the move. The move required multiple trips over the course of 3 months, many sheets of acid-free tissue paper for wrapping and packing, 56 boxes, and many individually wrapped large or bulky items. Some of the 56 boxes held under ten objects, some of them held hundreds. We had a list of the objects in each case and location, made corresponding labels for wrapping and checked each item off as they were wrapped and packed. 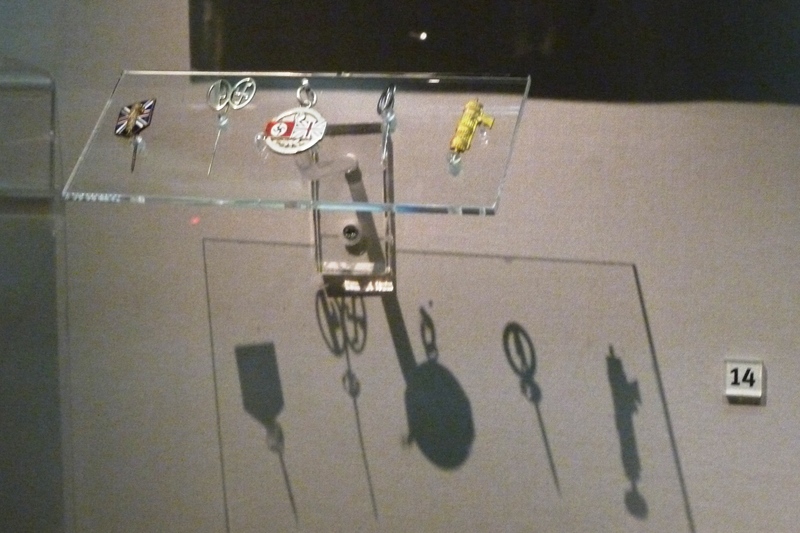 Objects were also photographed as and when needed for the Modes database, as some of the objects on display had only brief records without an image on Modes. We numbered the boxes which we then updated in the Temporary Location field of Modes, so we could keep track of what had been boxed together and what had been put back once we were back at the stores. The wooden shelving units inside the display cases were also dismantled, and will be reused by Andy for various techincal projects (a good example of reusing what you can from exhibitions or permanent displays!). We also removed all of the drawers in the foyer which contained geology and natural history specimens, as well as the model skeleton much to the dismay of the cafe staff! I think they had become quite attached to him. 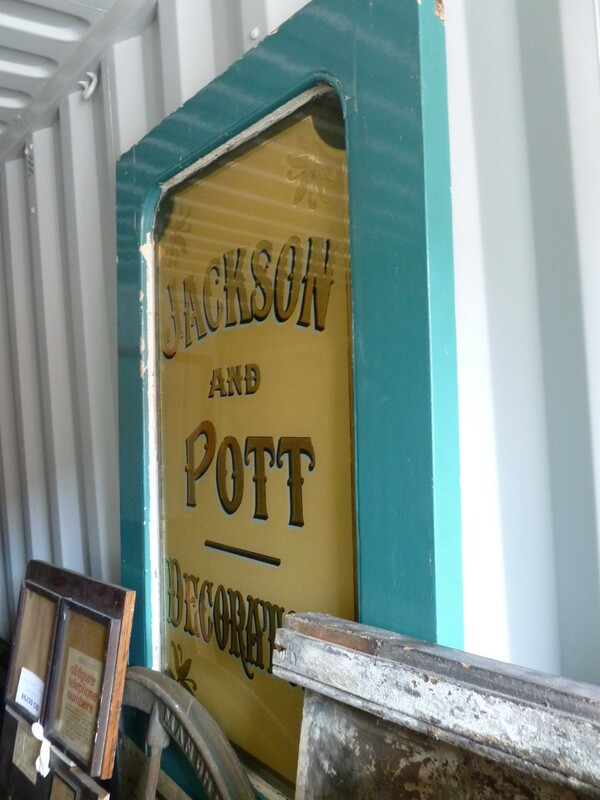 Some of the larger objects such as shop signage which were fixed to the walls in Vernon Park are now stored in the architectural salvage store. This is a secure storage unit which holds various large objects including shop doors, signage, outside lamps etc. I hadn’t been inside the salvage store yet this year, so it was interesting to see all of the goodies inside! Once back at the collections store, we initially tried to keep up with putting the objects back into the collection but the boxes soon built up. As mentioned earlier, some of the records on Modes were rather brief so needed retrospectively upating with more detailed description and images. 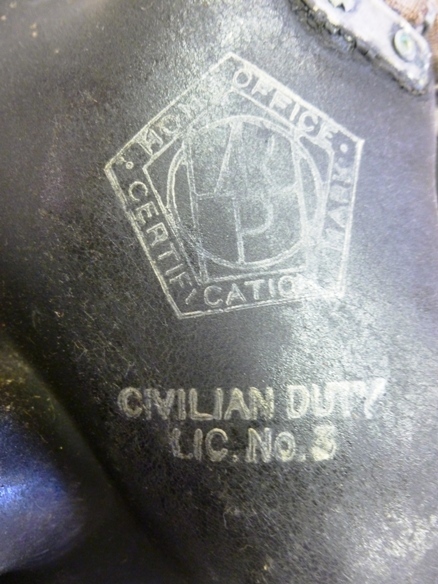 Many of the objects also needed properly marking to accreditation standard; they were previously labeled with a tag but not securely marked. So I did lots of sewing, marking with paraloid or writing with 2B pencil on the objects. 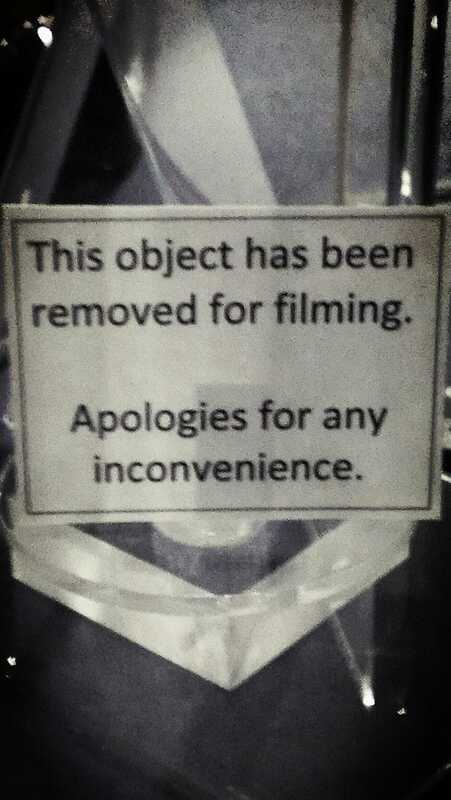 This was required before the items could go into their new permanent location. Some of the objects also showed evidence of pests, such as Carpet Beetle caracsses or their frass (bug poop!) – and so required brushing and freezing before they could be put with the rest of the collection. 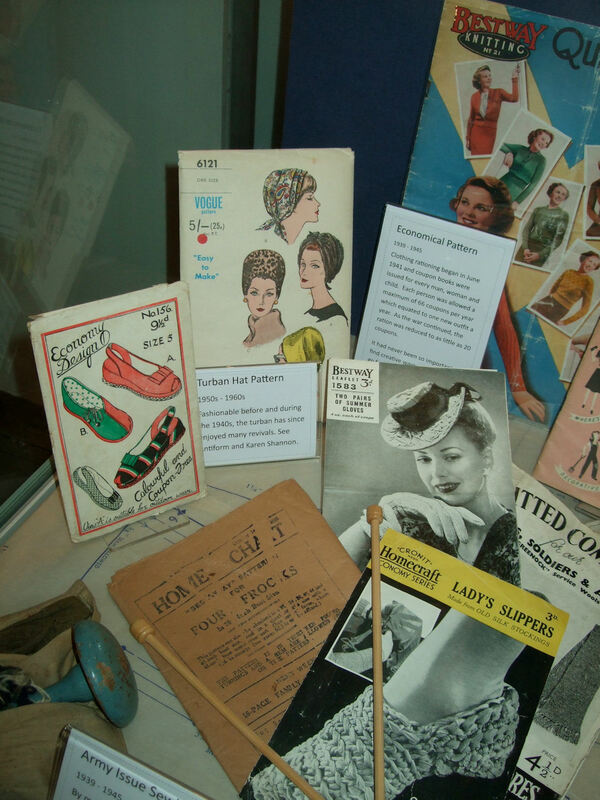 Some of the objects from Vernon Park were earmarked for use in the redevelopment of the Air Raid Shelters, for a new display of collection items in the reception and shop area. A new larger display case (which will also be better suited to protecting the objects from the harsh environmental conditions) has enabled us to choose a variety of objects, some which have not been on display before. A trip to the IWM North in Trafford Quays meant we could see the way in which they display their variety of objects; the stands and plinths they have used for objects of varying size were excellent and were a good inspiration for presenting our lovely objects. Our objects are currently spread out on a table in the stores (as in the earlier image), and have been re-jigged to see what looks best in what order. The most important issue is to give the objects height in the case and so we hope to have specific perspex stands for certain objects. 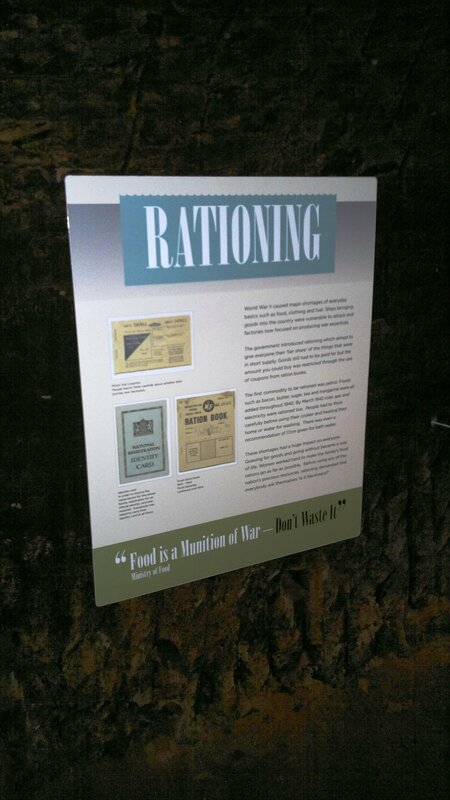 The Air Raid Shelters site has been closed for a few weeks whilst the refurbishment of the reception and the installation of the new interpretation panels has been completed. There has been new flooring, improved electrics for the lighting and the shop has been refurbished. 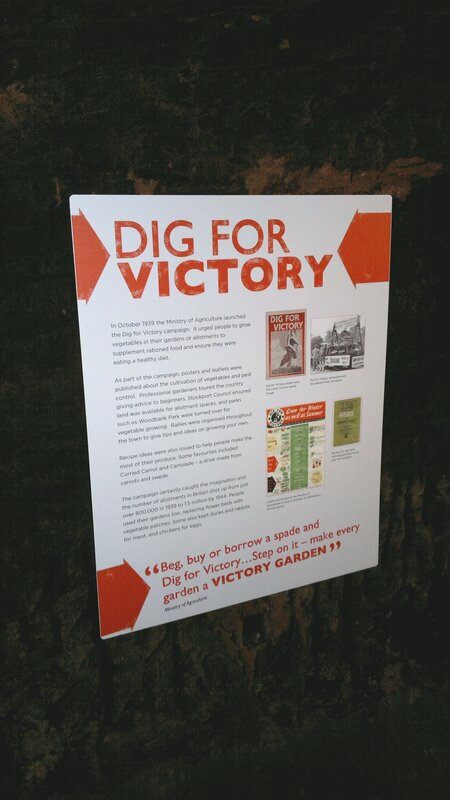 New interpretation panels have been installed by Andy and Katie, the new techincal trainee. Today the Air Raid Shelters are open again to the public, but there will be an official launch of the site later in June. 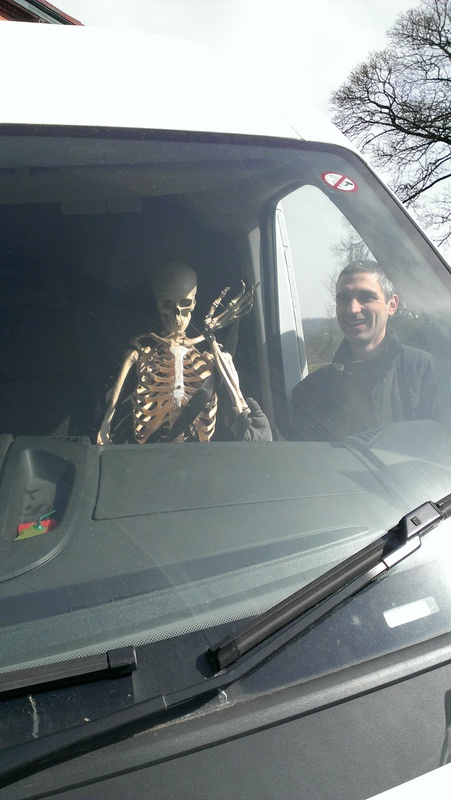 Overall the move of objects from Vernon Park has been a great experience, albeit a challenging one! Moving so many objects to a deadline and sorting the documentation and integration at the other end has been a long process and is still going on. With the Air Raid Shelters redevelopment happening simultaneously, as well as other day-to-day jobs, personal organisation (I love lists) and pulling together as a team has been crucial! A rather hatty post with some Bramhall bits too. This update has been in my drafts for a good few weeks. A lot has been going on at Cheadle so I haven’t had chance to finish and publish it! A month or so ago, the ITV programme Dickinson’s Real Deal came to Stockport Town Hall. Because of Stockport’s strong link to the hatting industry and obviously boasting the UK’s only hatting museum, a scene was filmed for the show with David Dickinson interviewing one of the Hat Works tour guides and demonstrators, Sue Lea. 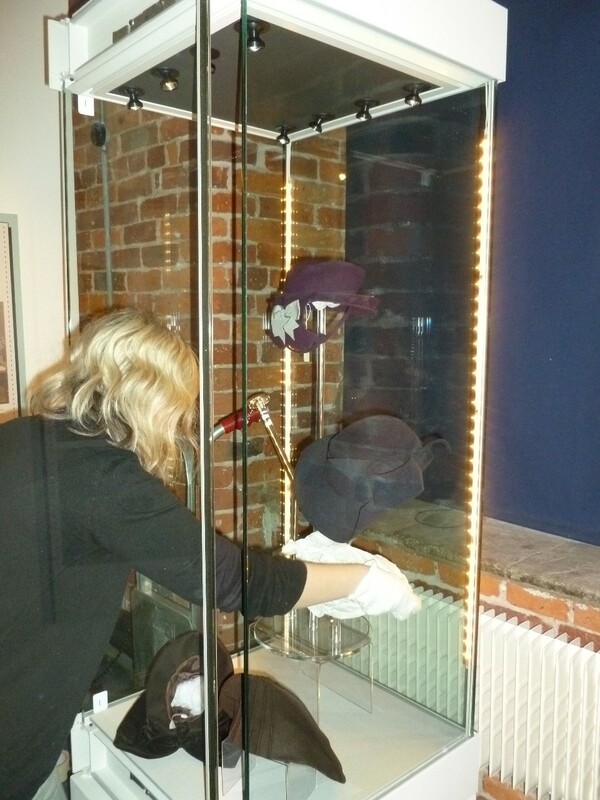 For this scene, some of the hats at the Hat Works were taken off display by myself and Janny, to be handled by David and Sue (in gloves of course!). Katie was there on the day to oversee the care of the collection objects. The hats taken for the filming were a selection of miniature hats (Trilbys, Top hats, and a Straw boater), an exaggerated 18″ high Stove Pipe Hat made by Woolfendens of Denton to celebrate the centenary of the company in 1913, and a ‘normal’ 7″ high Stove Pipe Hat. David Dickinson was apparently a very lovely gentleman, and was impressed with the Hat Works guided tours being priced at £2.65 per person, calling it ‘cheap as chips!’ – hopefully the scenes make it to the final cut. We should find out when it airs on the telly soon – I will tweet or blog about it as soon as I know! 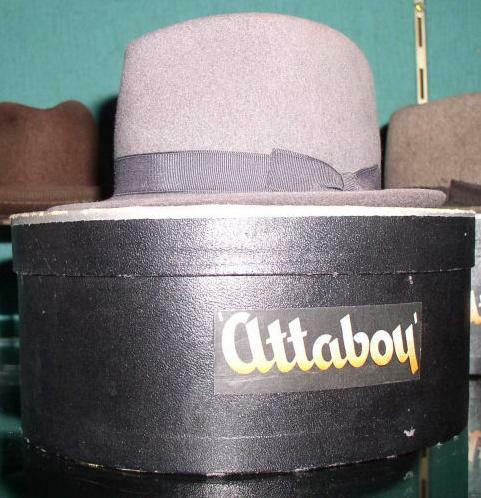 We have a few new acquisitions, the first being a Walmar hat from the 1950s/60s. This hat was kindly donated to the museum service in excellent, possibly unworn condition – it still has the original label on! 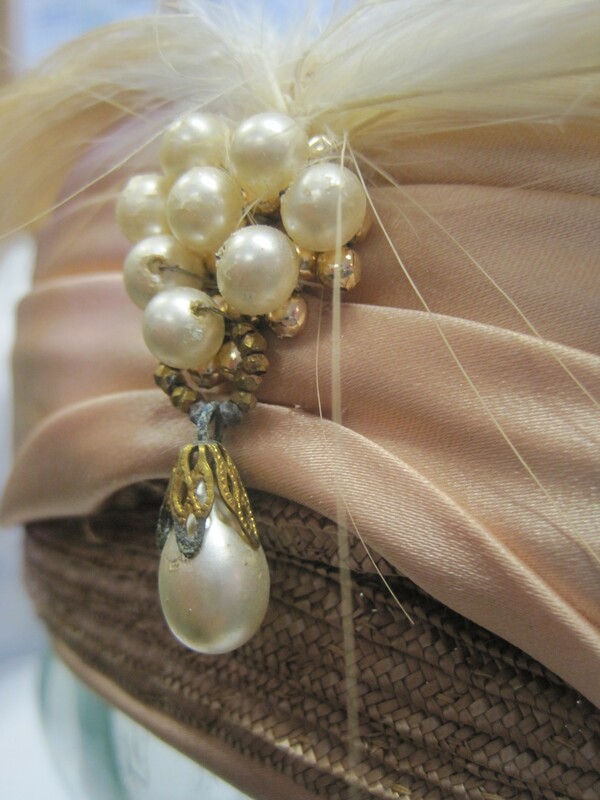 The hat is a straw turban style hat, with peach satin material, feathers, and clusters of pearls and gold beads with a single teardrop pearl. 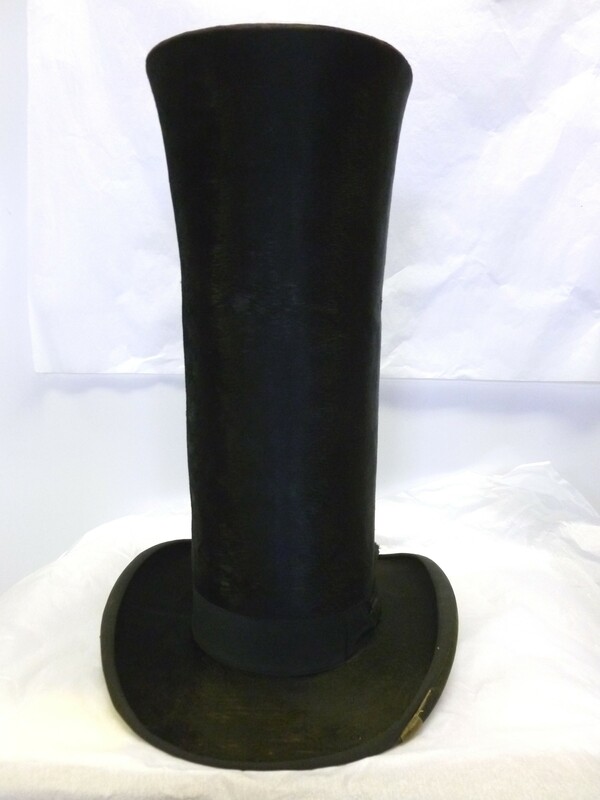 This hat is now on display at the Hat Works museum, in the Fantastic Hats case. I love it! I also got the chance to write a short article for the Stockport Heritage Magazine, on my favourite object in Stockport’s collection. I chose this hat – and from these photographs, I’m sure you will see why. 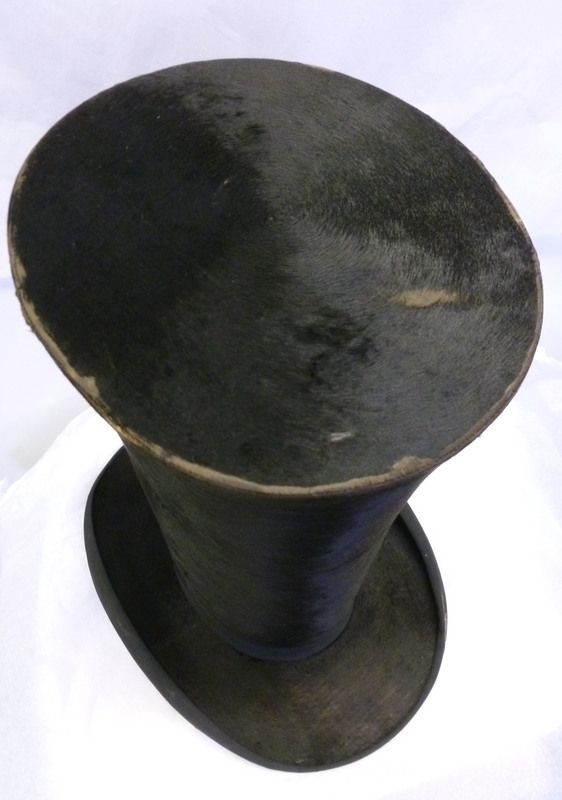 The other new acquisition is a hat previously on loan from Rachel Trevor-Morgan, which has been converted to a gift. 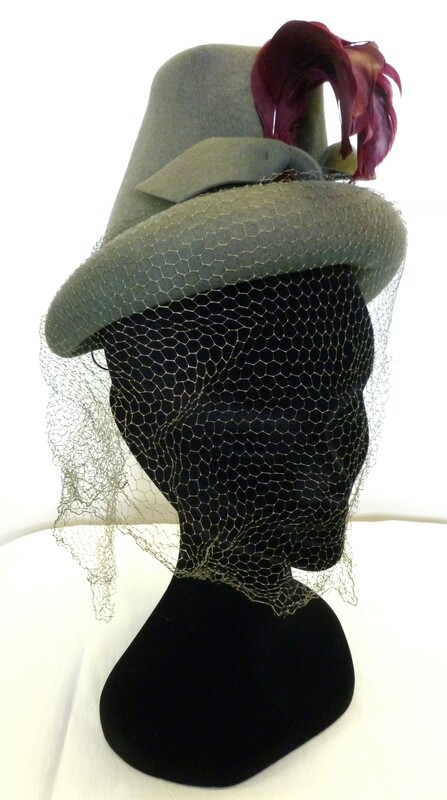 Rachel Trevor-Morgan is a milliner to H.M. Queen Elizabeth II so it is excellent to have a contemporary hat from a prominent designer in the collection. 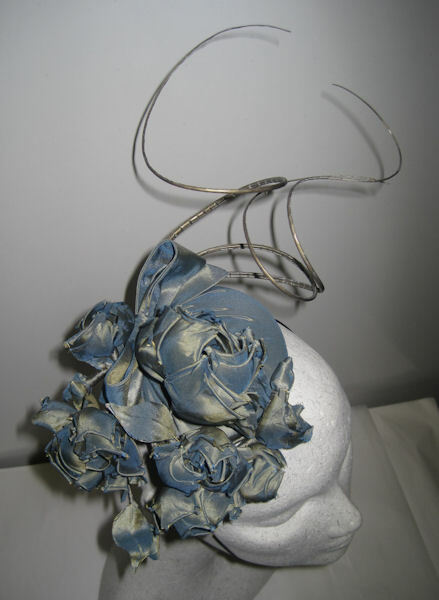 It is a two-tone dusky blue and gold taffeta pillbox fascinator hat, with rosebud and leaf detail. Now onto the Bramhall part of my post. A couple of weeks ago, Janny and I visited Bramhall Hall to return some objects to their previous locations. They had been in storage elsewhere in the house, whilst the christmas decorations were up for the festive season. During the visit, we went up into the roof space. 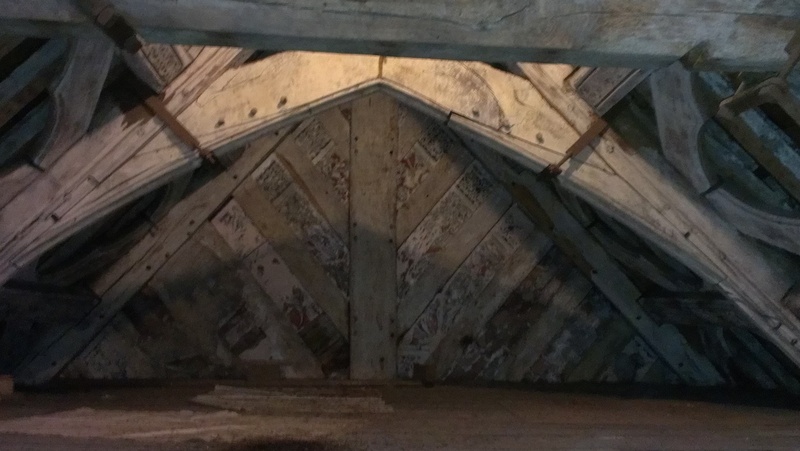 I thought I would take some photographs to show the wall paintings that are on the inside of the roof, and also a photograph of the quatrefoils. 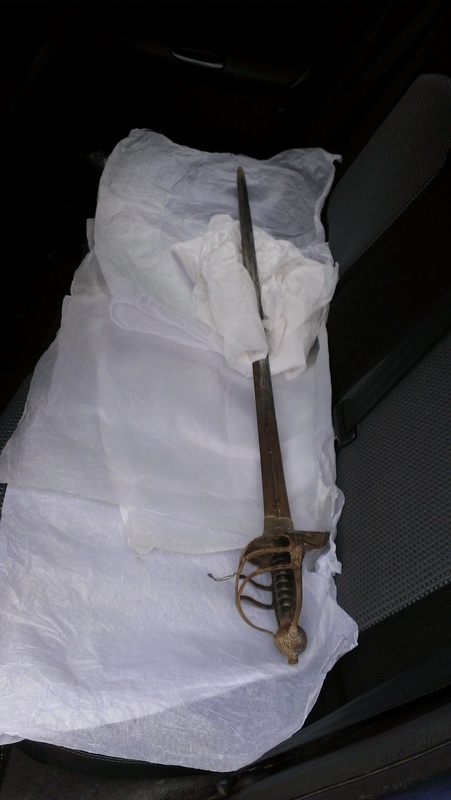 We also brought back a sword and a musket back to the stores, to be safely packed away for the time being after being in the house for a long period of time. 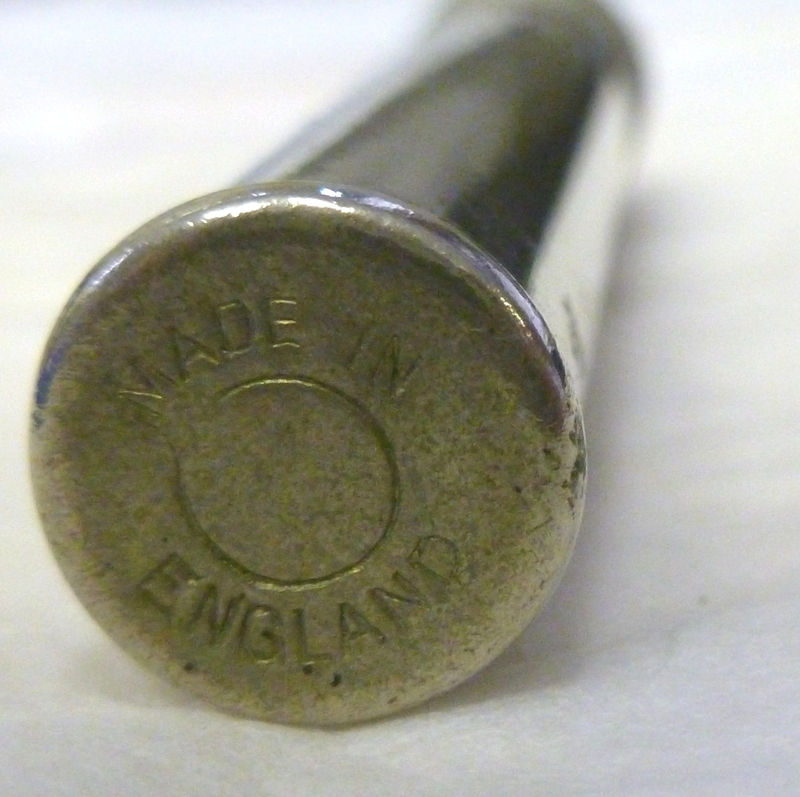 b) where the licence so provides, prohibited weapons and prohibited ammunition which are, or are to be, normally exhibited or kept as aforesaid, without the authority of the Secretary of State or Scottish Ministers under section 5 of the Firearms Act 1968 (as amended). (see the full document here – opens a PDF file entitled Firearms Law; Guidance to the Police). Next I will be posting about the Air Raid Shelters redevelopment, a visit to the Imperial War Museum North and meeting Sally Smith, the HLF Grant Officer who came to visit all of the Stockport trainees to see how we were getting on and what we have achieved and thought of our year so far. Cliché title, but… ‘New Year, New Exhibition’. 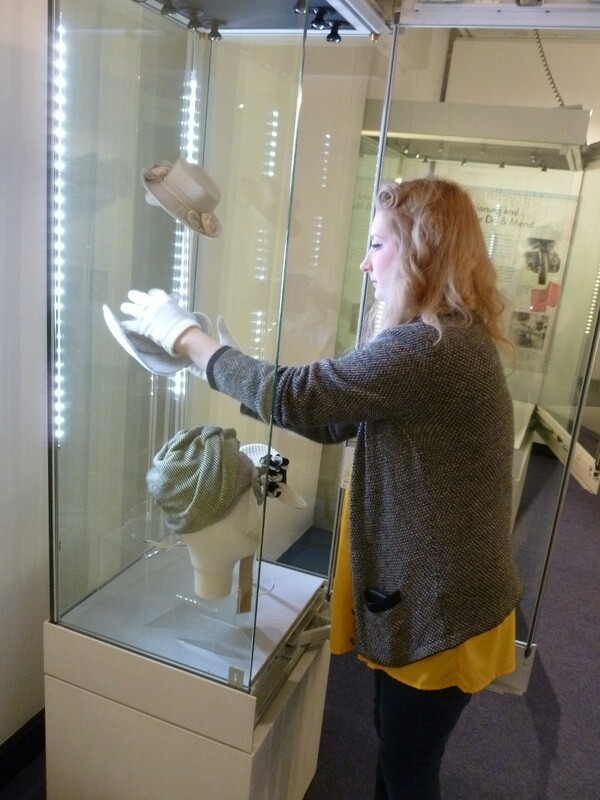 Before the Christmas break, lots of hats were arriving at the collection stores, on loan for the new temporary exhibition, ‘Redesigning Fashion: How to Change the World in Style’. 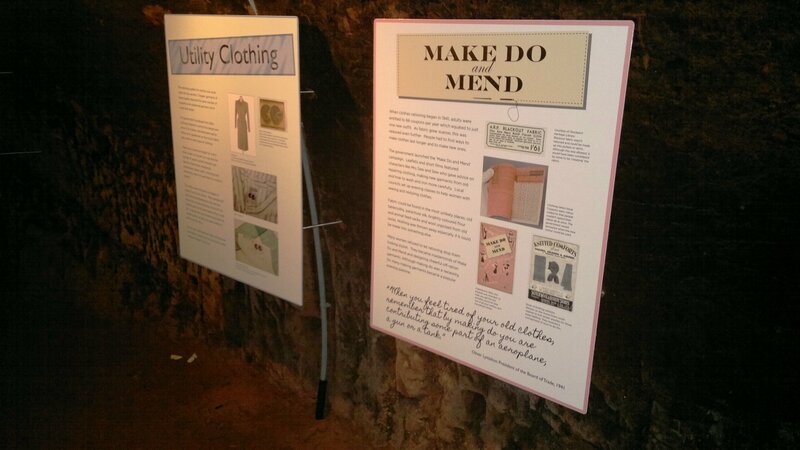 The idea behind the exhibition is to show Make Do and Mend and Utility clothing fashions in the 1940s, comparing it to the sustainable green fashion ethos being employed today by many designers. As mentioned in the previous post, many of the hats on display are from various designers, including Little Shilpa, whose hats have come to Stockport all the way from India! Little Shilpa has created hats for Lady Gaga, an interesting article about this can be found here, courtesy of Gaga Fashionland (2009). 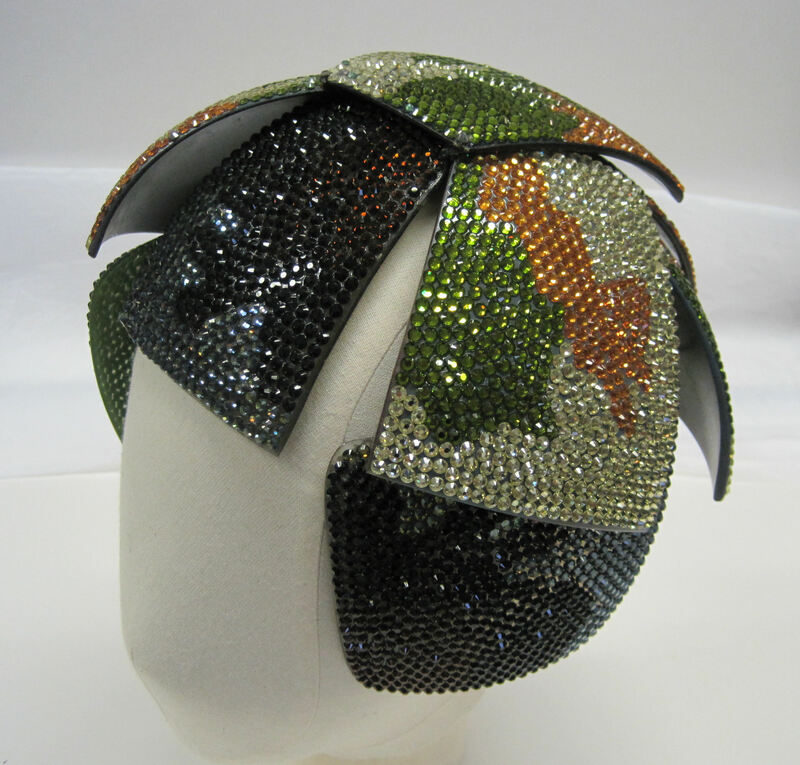 You can see the similarity in designs between the silver hat Lady Gaga is wearing in the aforementioned article, to the glittery camouflage hat on display at Redesigning Fashion, shown here. Other designers showcased in this exhibition include British milliners Rebecca Thomas, AKA Rockwife (who has been mentioned in this previous post: some of her other pieces are currently displayed in the ‘What’s Hot!’ case at Hat Works); Melanie Lewiston, Margaret Woodliff (whose hat appears on the exhibition leaflet; an article about the steps making this hat can be seen here, courtesy of Made by Hands of Britain, 2012) and Elsa Cappelli (who works with groups in Uganda, making sustainable decorative plaits from wild date palms which are then used to create ethical high fashion hats) – among many others! 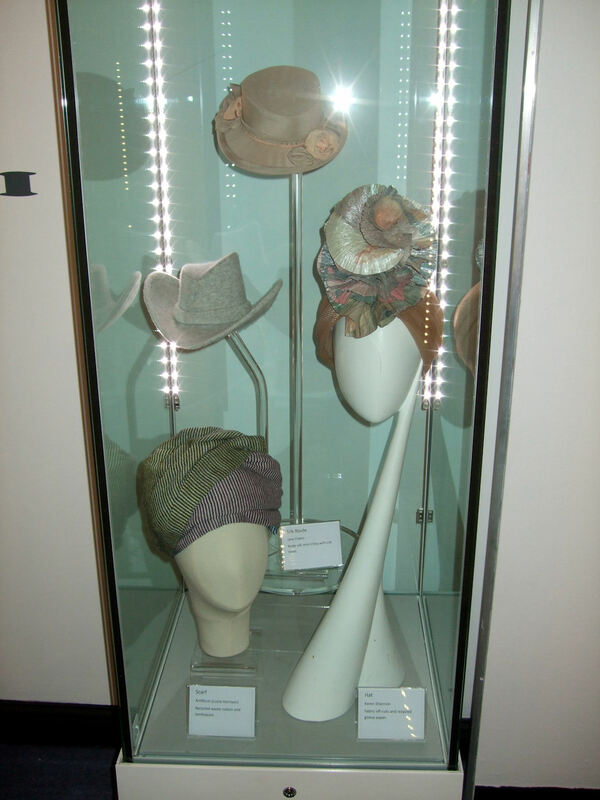 Also on display are hats on loan from the Manchester City Galleries Costume of Gallery, and lots of objects from our museum collection, thus showcasing a mix of the old and new. You would not be able to guess what was used to make a lot of the contemporary hats on show – they have been made so beautifully, and the recycled materials have been used ingeniously. So… after Christmas we took down the previous exhibition ‘Hot Heads’, and packaged the hats ready to send back to the designers. Then it has been a process of installing the new exhibition: some walls being painted in an accent colour; interpretation panels being printed and put up; dressing the cases to display the hats; doing an inventory of the location of objects on MODES; object labels and captions; installing the AV show on the television; installing the commentaries from designers on the listening post… the list goes on! 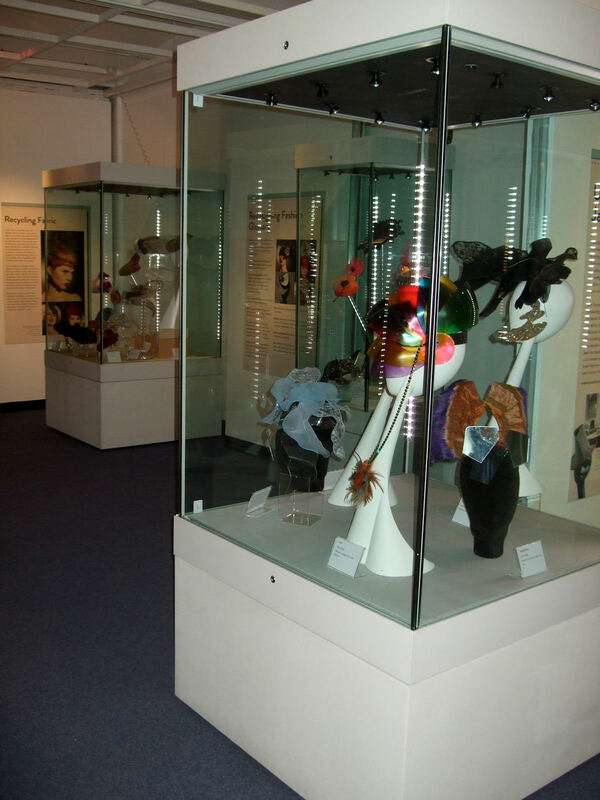 Many people have been involved with putting the show together, the curatorial team, the technical team, and volunteer guest curator Sharon Bainbridge [milliner and millinery tutor]. 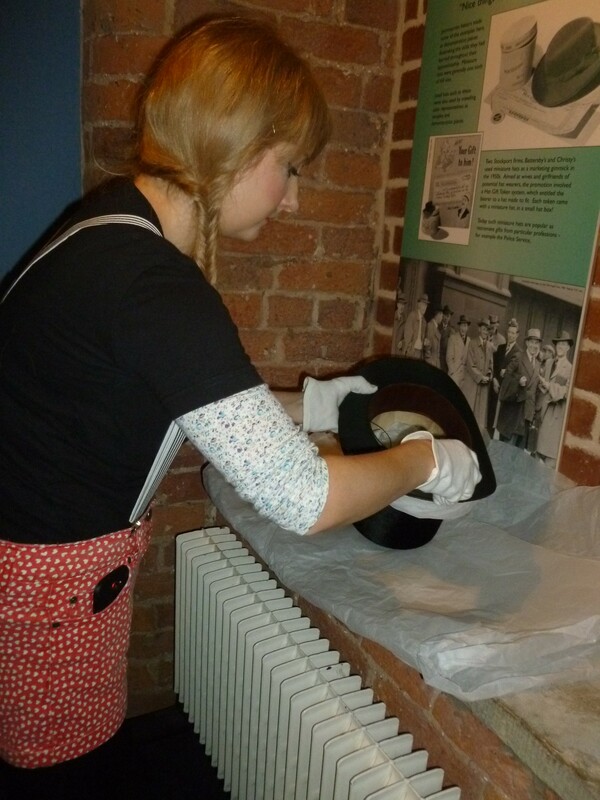 One of the milliners, Rebecca Thomas (AKA Rockwife), whose work appears in the exhibition, also volunteered for a couple of days to see what went on behind the scenes. Here are some photos from the installation of the exhibition. The preview launch for the exhibition was supposed to be on Friday, January 18th. Unfortunately due to the snowy conditions across the country, the difficult decision was made to postpone the event. ‘Safety first’ – especially since people would have been coming from all over the UK for the evening, and may not have been able to get back home! I think it is for the best, since more people will be able to attend once the snow melts and normality resumes (….I type this blog working from home due to being snowed in myself!). I look forward to the preview event when it goes ahead! 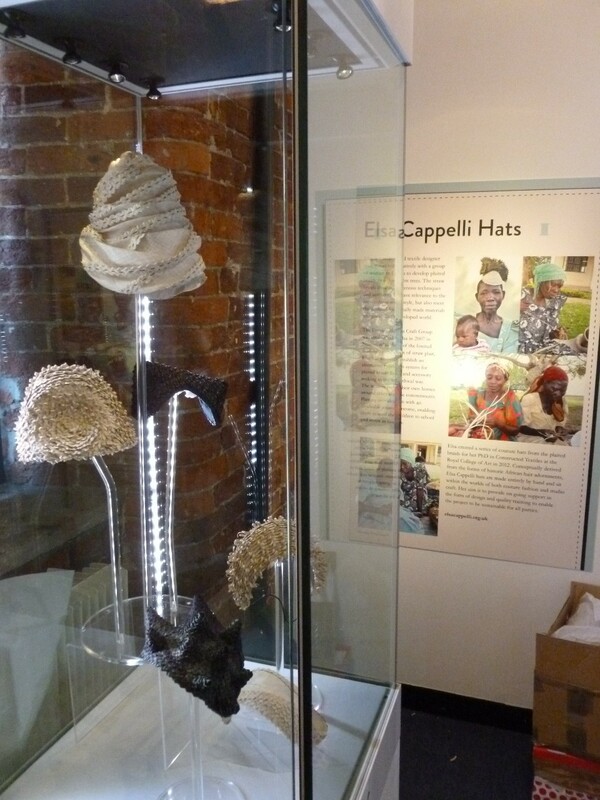 Bronwen and Janny worked on the finishing touches to the exhibition (including displaying one or two last minute contemporary hats which arrived), which looks beautiful. 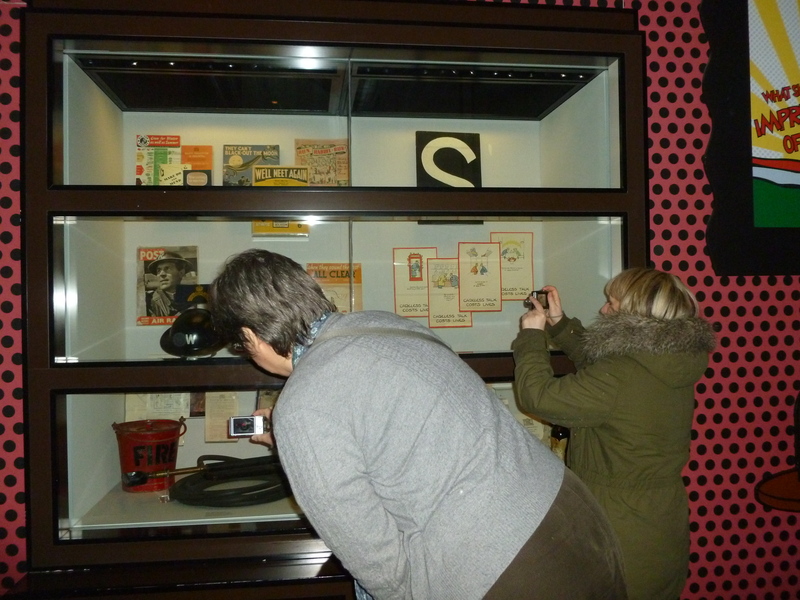 Here are some images Janny took of the exhibition before it opened to the public on Friday. 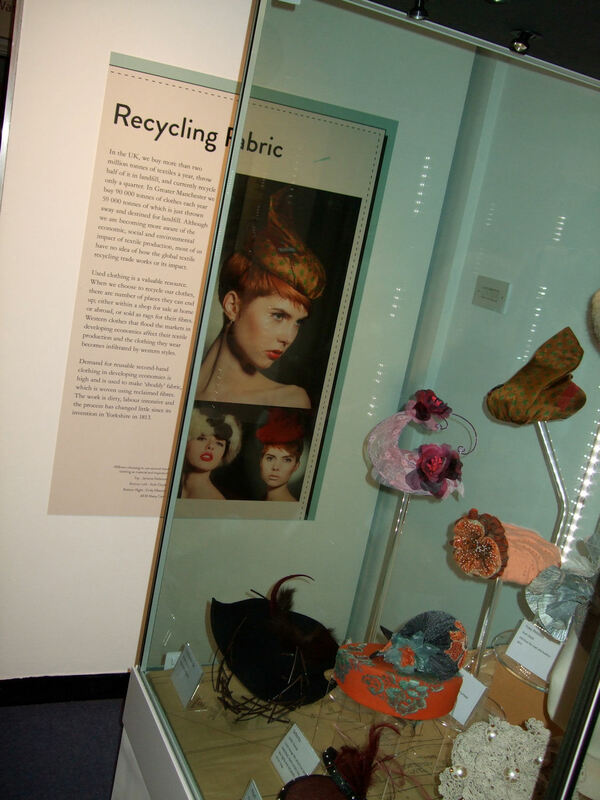 Panel – recycling fabric; and a case showcasing hats made from materials such as a shrunken cashmere jumper and recycled glossy paper! If you are interested in millinery, Make Do and Mend, Utility wear, recycling, sustainability, fashion, hats… come and see the exhibition! 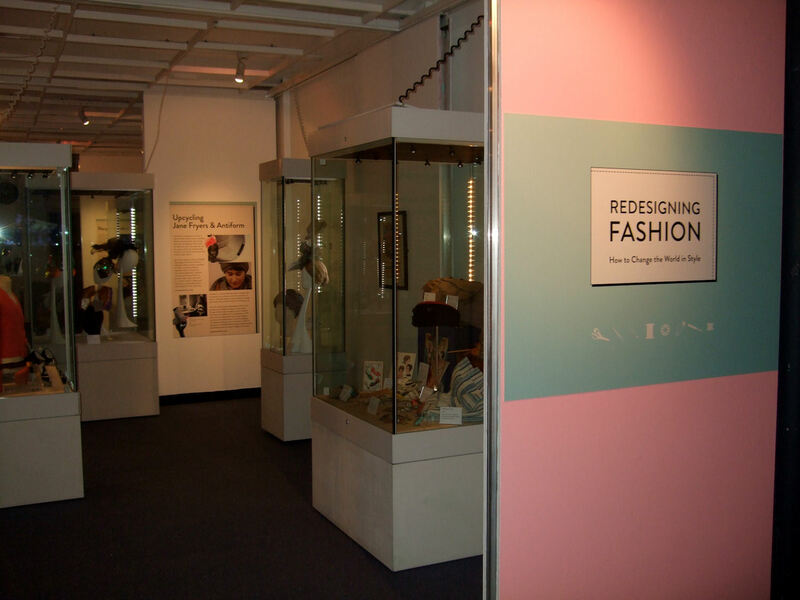 Redesigning Fashion is on NOW, until 7th July 2013, at the Hat Works museum, Stockport (and less than 5 mins away from the train station and bus station!). Entry is FREE to the museum as well as the temporary exhibition so do come along. When you visit don’t forget to tweet or facebook about it, and use the hashtag #redesigning – enjoy! What’s Hot at Hat Works…. and an upcoming exhibition for 2013. 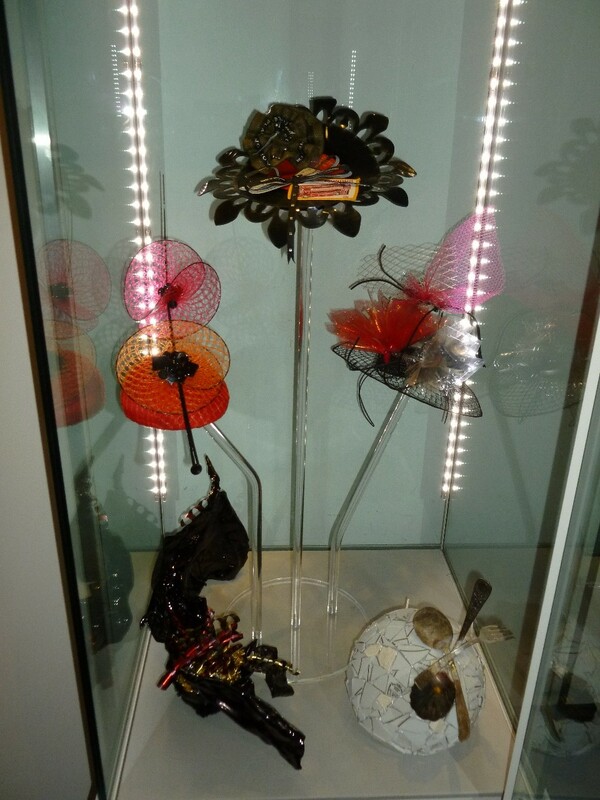 In the Hat Works museum there is a set of cases for temporary displays of work by contemporary milliners. The most recent installation is work by Rebecca Thomas, AKA Rockwife. The three cases have been transformed into a winter display with snowflake garlands and hats including a Nordic Hood and a Bridal headpiece. 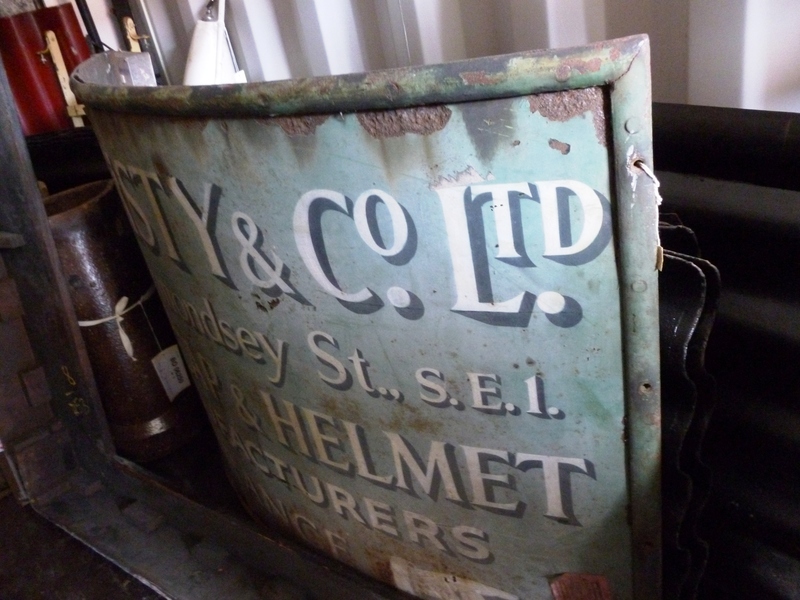 I went to the Hat Works on Thursday to take photographs of each piece, to add to the record of the loan on MODES. 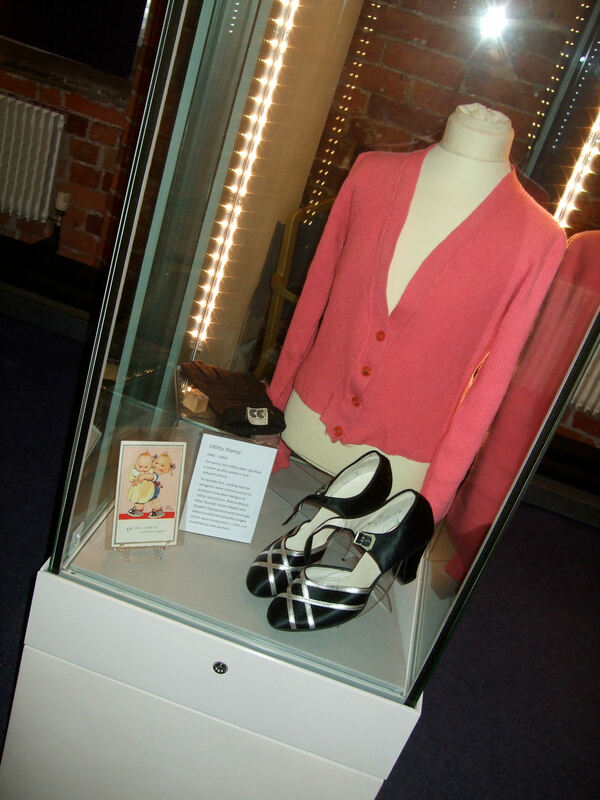 In January 2013, a new temporary exhibition will be unveiled at the Hat Works, entitled “Redesigning Fashion”. 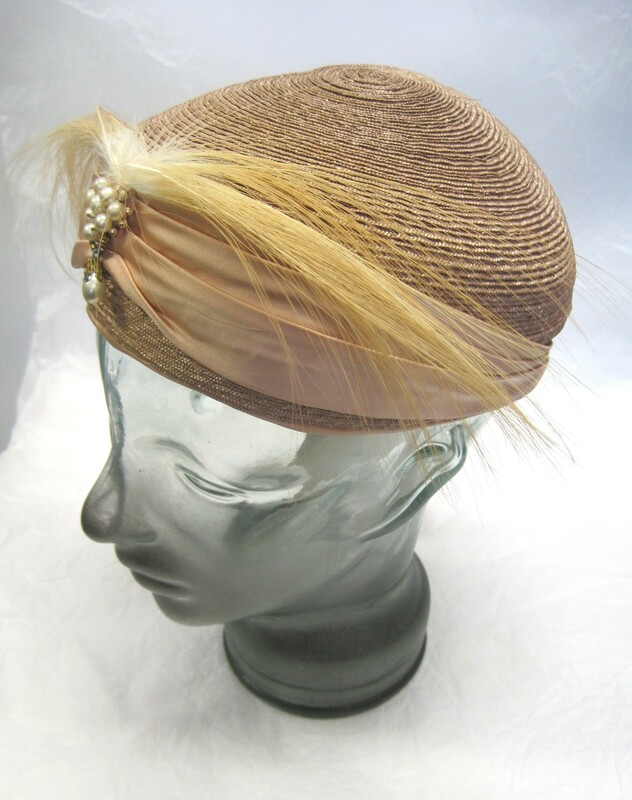 It covers themes such as the effect of World War II on the fashion industry, utility wear, and how the ‘make do and mend’ ethos is being employed by milliners in the present day, creating sustainable hats by reusing and recycling other materials. Items on display will include objects from the Stockport museum collection, loans from The Gallery of Costume (Platt Hall, Manchester), and contemporary millinery by various designers including Little Shilpa, Rosie Totiah, and Bailey Tomlin. The contemporary make do and mend hats have been arriving at the stores in the past couple of weeks, which have been unpacked, photographed, labelled, and added to MODES by Janny. I did the same with the loan hats from The Gallery of Costume to MODES. 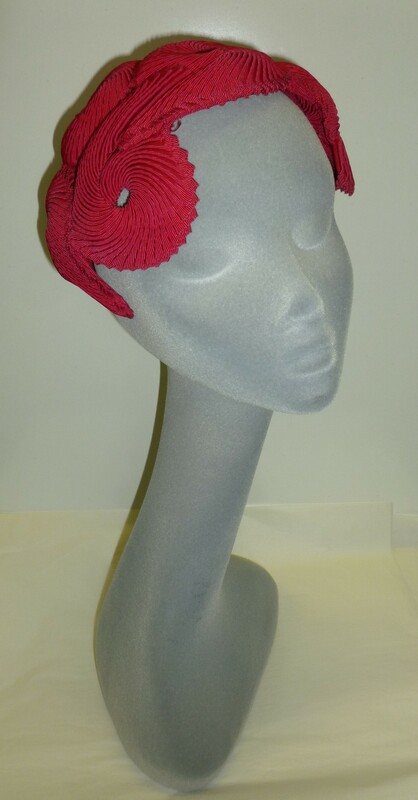 Here are a few images of the hats you will see in the exhibition. Stiffened felt hat, a loan from The Gallery of Costume; 1942-1943.